If you Google “Fisher DeBarry”, EphBlog is currently number 1 on the list of links, thanks to Derek Catsam’s post two days ago. Cool or weird or pathetic? I don’t know. UPDATE: Ahhh. It’s because we misspelled DeBerry! Hmmm. Perhaps misspelling in the search for hits is no vice . . .
A Wiki is a site with many informative articles that anyone can edit. Feel free to contribute! We want this site to become a definitive source of information about Williams. Articles, biographies, stories, and how-to’s are welcome, and on nearly any subject: buildings, people, organizations, classes, computing, hiking, anything of, about, or near the college. A school filled with scalliwags, villains, and other low-lifes. They stole half of Williams College’s library when they began their misadventure, and they’ve only gone downhill from there. Not bad, but Aidan could do a lot better . . .
It’s Family Days at Williams this week-end. How different are things now from what they were like 50 years ago? Probably different on the surface but just the same underneath. I suspect that these parents had similar dreams for their son (who would now be 70) that today’s parents have for their own little Ephs. Note that our previous use of this picture was the first inkling of what EphBlog would become today. Trivia question: Who is the pictured Eph, class of 1958, I think? “It just seems to be that way, that Afro-American kids can run very, very well. That doesn’t mean that Caucasian kids and other descents can’t run, but it’s very obvious to me they run extremely well.” These are the words that U.S. Air Force academy football coach Fisher DeBerry said in remarks broadcast Tuesday night by Denver television station KWGN. Given that his comments were about race, and may have been courting a stereotype, I suppose we should not be surprised that he is in hot water. I hope that my civil rights/anti-apartheid historian credentials are enough that what I am about to say does not get me in hot water, but I hope Air Force does not punish DeBerry, who, in addition to being a very successful coach, also did not really say anything wrong. Now don’t take me the wrong way – I would not place DeBerry as the most eloquent spokesman on race in America. But look at what he said – from his years of coaching football, in general black kids run well. There are white ids and others who run well, but black kids run well. Now I do take issue with the implied inclusion that “all ” black kids run well. They do not, of course, and I am sure DeBerry knows this. I competed in events that Fisher DeBerry might associate with black success: The jumps, especially the long and the triple jump. Williams had a very good track team, and one of the great things about track and field is that you get to find out exactly where you are in the global hierarchy. In addition to being very numbers driven, if you are good enough at a lower level you will qualify for bigger meets. Williams is a division III school, but we routinely competed against DI schools. I was a good enough jumper to compete against the big boys, but I was well aware of where I fit into the overall world of track and field. In any case, when I would get to bigger meets where I may have known fewer of the athletes, or if I competed away from New England, say in the South, I would look around and scout out the competition. When I was trying to size up the other jumpers, when I was looking at strangers wearing university of Miami or Florida State or Christopher Newport or whatever other jerseys, I would tend to focus more on the black jumpers than the white guys. I am not proud of it, but I am also not ashamed. And I certainly would not say that it was an illogical conclusion to draw. I would guess that I have a batter grasp on track and field than most of my readers, but even acknowledging that, I think I am on pretty firm ground to ask anyone who would criticize me the following question: Name five truly great white American long jumpers in the last ten years. Twenty years. Now the irony, as I discovered many times, is that there were times when I should have been watching out for the big white guy from Western Carolina or Albany State or the University of Miami (at the biggest meet I ever competed in, the Florida Relays in 1993, I got beaten out for third place by a Miami [Florida] guy on his last triple jump who was, if it is possible, paler than I am. There were even times when those guys maybe should have been looking out for me, as I ended up winning. Anecdote #2: When my fellow jumper and teammate “Boogie” (His name was Stuart, but we called him Stu, and then it became “Boogie” after the Led Zeppelin song “Boogie With Stu”) would get to the really big meet, the DI/All New England meet, say, we’d always joke as we watched the early rounds of the sprints about the white guys and how they had better enjoy their time, because they would be watching the finals. Boogie was also a sprinter. He was also black. And lo and behold, once the finals of the 60 or 100 rolled around at the All New England meet or the Florida State relays or nationals, the finals were overwhelmingly African American. We were always joking, but the joke, like many jokes, had an element of truth to it. I have no idea why this is so. There are certainly fast white guys. And Asian guys. And Hispanics. And most people, black, white, Asian, and Hispanic, are slow, cannot jump, cannot lift things and so forth – when you are looking at college athletes you are already talking about a genetically exceptional subset, so drawing widespread racial differences from the whole population seems foolish. But I will double down my bet on the long jumpers. I’ll grant you Jeremy Wariner, the 2004 Olympic Champion in the 400. I’ll even give you the Greek 200 runner who won in 2000 (and who failed a piss test in 2004 . . .) And I will remind you exactly what DeBarry said about white athletes: “That doesn’t mean that Caucasian kids and other descents can’t run.” And then I will ask a simple question related to the one I asked earlier: Howe many white medalists have their been in the Olympics and World Championships in the 100, 200, and 400 since 1968? That is 10 Olympics, times three events, times three places in each event. I’m not much at math, but that is 90 possible medals. Even keeping in mind that the United States, the world’s most dominant sprint nation for most of that period, boycotted the 1980 Olympics, is there anyone out there who wants to bet that thirty of those medals went to athletes who were not black? Anyone want to bet on whether or not twenty did? Now let’s bring it back o football. Jason Sehorn made some waves for the very fact that he was a decent white starting cornerback in the NFL. And in some attempts to explain why that was so, there was one compelling argument made: That one factor is that coaches simply steer black athletes toward certain positions and white athletes toward others so that irrespective of actual abilities, black kids in integrated high schools will play corner, their white teammate safety. That makes at least some sense. But whatever the case, can anyone honestly say that however anecdotal, and however clumsily stated, Fisher DeBarry was actually wrong? And can his desire to recruit more black athletes to the Air Force Academy actually be something we want to condemn? Especially when DeBarry’s black players have rallied around him? It would seem patently unfair to punish him for his comments. There is lots of very real, very serious, very disturbing racism out there. There are coaches who certainly are racists. But it would be absurd to punish Fisher DeBerry for the current reality of the nature of the sprinting and jumping events and the skill positions in the NFL (and anyone who has been to a college track meet knows that these two things are fungible). Although Williams only gets a brief mention, this CNN article discusses students displaced by Katrina. Accustomed to low and flat New Orleans, Tameka Noel finds herself huffing and puffing as she walks the hilly campus of Amherst College near the Berkshire Mountains. And though it’s just October, it already feels like winter to her. She misses friends, and Cajun food, and Bourbon Street, which puts small-town Amherst’s nightlife to shame. She and the six other students from Xavier University who wound up here this semester won’t lie and tell you Hurricane Katrina was the best thing that ever happened to them, just because they get to spend time at an elite liberal arts college. They will, however, say they are grateful for the hospitality, and that — when all is said and done — their time at Amherst might have broadened their education. Amherst took its visitors shopping for the winter clothes they suddenly needed, and is even paying for them to fly home for Thanksgiving. In the classroom, it organized tutorials to help them catch up after missing the first two weeks of class. College officials say the students are doing fine academically. For the Xavier students, it’s a way to get the courses they need to stay on track to medical school. But it’s also a chance to try some new things. At Xavier, they said, most classes are in a lecture-and-drill format. Their Amherst seminars have been a nice change of pace in both structure and content. “We discussed homosexuality, which is definitely a big taboo at Xavier, being Catholic and all that,” said Noel, who added an elective on “cross-cultural constructions of gender” to her science coursework. The different classroom experience “is something I’ve enjoyed,” she said. Worth reading, and thanks to David Rodriquez ’06 for the link. EphBlog, of course, specializes in taking people outside their comfort zone, at least on this topic. Noah Susskind ’07 sent in these further thoughts on the topic of file sharing. The WSO thread mentioned yesterday got better and better. (Don’t tell Dean Roseman! She thinks blogs are bad news.) Best post was by Ryan Harper. Have you ever been in a class when a “racial issue” came up and you could feel other students eyes shifting ever so slightly, waiting to see what the colored kid’s response is? Or perhaps, on much rarer occasions, the instructor might blatantly ask her for her input. She’s just giving you a chance to defend yourself right? Or is she giving the rest of the class (realistically, more like a few students) a chance to see how ignorant and presumptive their comments are? It’s certainly a close call, but I’m more inclined to think that these little skirmishes aren’t engineered just for me to brush up on my rhetorical abilities to deflect covert racism. We ARE here to educate the white kids. What else is “diversity” supposed to mean? Moore’s wide-ranging grasp of different epochs is the product of a lifetime of feeding the flame of his curiosity, kindled by the classical liberal arts education of his youth, about how the intricacies and subtleties of language, culture, social structure, and history shape institutional forces and biographies to create sometimes fantastic social worlds. Read the whole thing. More Williams students should do this sort of research, using the reseources of the College to explore the interesting lives of prominent graduates. Here is a fun WSO thread on stupid athletes. It is the same stuff that we have discussed before, but I love this handy summary from Julianne Shelby. Legacy, Tipped Athlete, Member of Socioeconomic/Ethnic/Geographic Minority -/-> relatively low test scores/poor academic performance. Well put! Of course, she forgot to include fat-cat donor status in her listing. See here for a (possible!) example of her first case and here for an example of her second. It’s also worth remembering that the size of the advantage is significantly different for different groups. Tipped athletes, especially football players, got much more of a preference than legacies. Certain racial minorities get more of a preference than geographic minorities. These may be good policies. They may be bad ones. But it is always surprising to see how many Ephs are misinformed about the actual facts of the matter. As if we needed further evidence that they will let anyone publish a book, Bleeding Red: A Red Sox Fan’s Diary of the 2004 Season, has officially been released. For reasons beyond my understanding, it is not yet up on Amazon (believe me, I’ll let you know when it is), but it is available (in mistitled form, with no cover image yet posted — these are clearly all intended as reminders of my place in the hierarchy) at Barnes and Noble, here. If you are interested in seeing the publicity material (with the cover image, a picture of yours truly, and blurbs from historian Charlie Alexander as well as from Saturday Night Live’s Red Sox fan and Kerry impersonator Seth Meyers) go here, scroll down to the bottom of the page, and click on the cover image of the book. I’d like to thank Ephblog readers and especially Dave Kane for inviting me to post my Sox diaries on Ephblog last year. There is an irony attendant in all of this of course — in terms of the historical profession, my Red Sox book does not help and in some circles may actually hurt my marketability. Soon enough I’ll have one of my “real” books out, but for now, let it be known that my Sox book may be a trifle, but it was a labor of love and I’ll always be glad that it was my first (you always remember your first, after all). Now what are you waiting for? Go buy the book (or wait until it is paired with ESPN’s Sportsguy, Bill Simmons’, book in the next week on Amazon). Ethan Brooks (’96) was signed by the Cowboys last weekend, which is pretty cool, as whether I like it or not, I get all of their games. After the Jets inexplicably let him go this summer, he was unsure as to how things would go. It was a weird situation for him, because his stock was most likely to rise only after someone suffered an injury. When Flozell Adams tore up his knee a couple of weeks ago, that opened a door for Ethan. Even though he was only signed last Monday, he was active and in uniform yesterday, as Bill Parcells twice raved about Ethan’s retention of the Cowboys’ scheme (there’s that Williams education at work!). He is listed as the swing tackle, the backup for both the starting right and left tackles. I saw him on the sidelines yesterday, but do not believe that he got into the game in that punch to the gut loss to the Seahawks. For those of you who would like to read a bit more about Ethan, I would strongly suggest John Feinstein’s newest book, Next Man Up: A Year Behind the Lines in Today’s NFL, which provides a fascinating look at a season of the Baltimore Ravens (yes, Billick is the most shameless self-promoter in the history of professional sports — roll over Bill Veeck, tell Charlie Finley the news). Ethan gets seven pages of his own plus many references throughout the book, and he emerges as a truly good guy. This also is the most honest he has ever been about his wife’s tragedy. My guess is that getting the treatment from Feinstein is the rough equivalent of having Halberstam, Turkel, or McCullough feature you prominently — they are not the best at what they do, but they are damned good and might be the most popular. Princeton began a serious fight against grade inflation a few years ago. The results so far are encouraging. In 2004-05, the first year under the new policy, A’s (A+, A, A-) accounted for 40.9 percent of grades in undergraduate courses, down from 46.0 percent in 2003-04 and 47.9 in 2002-03. In humanities departments, A’s accounted for 45.5 percent of the grades in undergraduate courses in 2004-05, down from 56.2 percent in 2003-04. In the social sciences, there were 38.4 percent A grades in 2004-05, down from 42.5 percent in the previous year. The natural sciences, at 36.4 percent A’s, essentially held steady. In engineering, the figures were 43.2 percent A’s in 2004-05, 48.0 percent in the previous year. Basic strategy seems to be to encourage/force individual departments to meet university wide targets. The departments are then left to their own devices as to both how to distribute the limitted number of A’s among introductory and advanced courses and how to encourage/force faculty members to do the right thing. 1) A lot of grade inflation has occured since the 1980’s. Back in the day, A+’s were virtually unheard of. [By you! — ed.] It now seems that they are almost common. See this 1998 Record article for background. 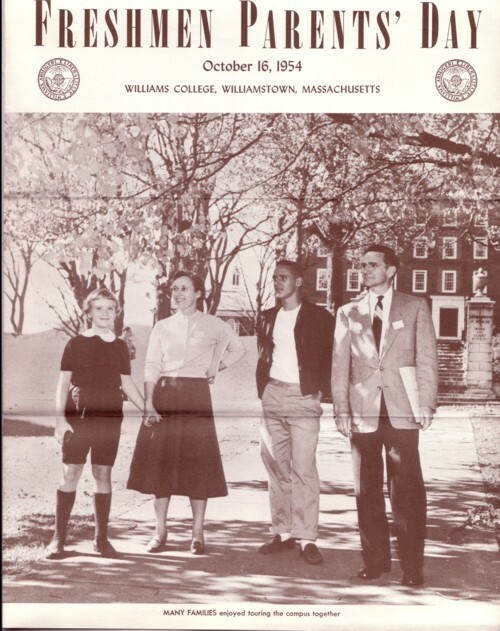 2) I am still waiting for Peter Siniawer’s thesis, “When A=average : the origins and economic implications of grade inflation at Williams College and other elite institutions”, to be posted on the College library’s website. The steady rise in student grade point averages (GPA) observed over decade the past appears to have halted since the implementation of a proposal by the Committee on Educational Policy (CEP) in 2000 that encouraged faculty to cap GPAs at set levels for each course level. At the time the proposal was made, the CEP Subcommittee on Grading reported a significant increase in average grades since 1990 from a 3.19 to a 3.34. This upward trend reflected a trend of grade inflation from the 2.67 average recorded in 1960. Thus, in February 2000 the CEP voted to set a maximum target GPA and disseminate GPA statistics on how each individual department fared in comparison to the targets. Where can I find the latest statistics? Trivia Question: What Eph’s singing voice has been heard by the most people around the world? Answer: Probably Lee-Hom Wang ’98. Like every plugged in rock star, Wang has a homepage and a blog. Wang has a busy schedule. It was great to see so many of you last Saturday when we had tea together with Xin Bao. The atmosphere was quite mellow and relaxed, not at all like work, but more like just meeting with friends. It was also great to chat with many of my fans online last week. The greatest thing about the internet is that I can chat with fans from all over the world; unlike other forms of media, it is completely international. Thank you all for the support you have given me as I continue to shoot the two movies CSF and TEKKEN, while also promoting my new album, “Forever’s First Day”. It sure is keeping me busy! Strange. I have never found album promoting to be too time consuming, but maybe that’s just me! UPDATE: Graduating class fixed thanks to comment below. I got the wrong year from Wikipedia, which I have also fixed. Surely there is an EphBlog reader out there who would be willing to borrow Diana Davis’s ’07 cat? So, I ask you now: Would you or your family, or anyone you know, or anyone anyone you know knows, be willing to take Tigger in? If you, or your parents in most cases, would not mind having an unobtrusive little cat around, who likes being petted and held, I would be most appreciative. If you or anyone else you could put me in contact with might be interested in borrowing a cat, PLEASE let me know. We will happily deliver her to any location on the east coast (broadly defined), from Maine to Florida. I kid you not. My daughters would love this, but, alas, my mother-in-law would not. Fellow Eph Blogger Mike Needham ’04 is quoted in the Record on the Porkbuster campaign. Reducing earmarks in transportation bills is one of the few political topics — like not nominating Alberto Gonzalez for the Supreme Court — that bring together EphBlog participants from across the political spectrum. Jim Duquette ’88 has been hired as the vice president for baseball operations at the Baltimore Orioles. “Anytime you get this type of responsibility and authority in one of the more heralded organizations in the game, it’s exciting,” Duquette told The Eagle last night. Duquette, 39, ended a lengthy tenure with the New York Mets. He spent most of his 15 previous seasons in baseball working for the Mets. See here for previous EphBlog posts on Duquette, but, of those, this is the one to read. I am not sure what they would talk about, but it would be fun to listen in. This hallway is not quite this dim in real life. Jeff Zeeman pointed out this article about Eric Dayton ’04 in an previous thread. With his photogenic good looks, charm, money and pedigree, Eric Dayton could have been Minnesota’s own John F. Kennedy Jr. But for most of his 25 years Dayton has kept a low profile, seeking challenges where success hinged on physical skill, intelligence and courage — not family connections. Yet, as the scion of two prominent, wealthy American families — the Daytons and the Rockefellers — the connections were always there. Connections are a good thing. Jenn Mattern, perhaps the funniest Eph Blogger, is also often one of the most thoughtful. In response to the devastation of Hurricane Katrina, Regis has broken a 91-year tradition and accepted our first transfer student, a young man from Jesuit High in New Orleans. Kudos to the admnistrators involved in what was not likely to be an easy decision, and, of course, kudos to those at Williams as well. EphBlog is powered by WordPress and delivered to you in 1.776 seconds using 33 queries..